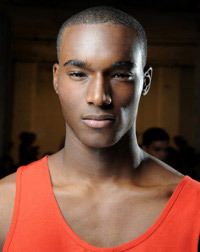 Corey Baptiste was born in Brooklyn, New York, United States, on January 30, 1991, is a American male model. He was discovered at the John Jay College in Manhattan. Baptiste began his modeling career in 2010. He made his catwalk debut for Phillip Lim show in New York. Corey's favorite hobbies are basketball, baseball and football. Reflex Homme Cover, Magazine Antidote, Flaunt, August Man Malaysia, Armani Exchange, GQ Italia, Harper's Bazaar U.S. and UK, L'Officiel Hommes Germany, W Magazine, L'Optimum, GQ Style China Cover, Vogue Hommes Japan, DSECTION Magazine, Vogue Italia Black, 7TH Man, CLIENT, Carbon Copy, Wonderland, L'Officiel Hommes Poland Cover, SLIMI Magazine Cover. Walked runway for Banana Republic, Cerruti, Greg Lauren, John Elliott + Co, Ralph Lauren, Boris Bidjan Saberi, Giorgio Armani, Brioni, Daks, Gieves & Hawkes, Todd Snyder, Emporio Armani, Bottega Veneta, Trussardi, Sibling, Ports 1961, Moschino, Corneliani, Loden Dager, Dolce & Gabbana, Frankie Morello, Nautica, Carlos Campos. Gap, Uniqlo, Adidas, Polo Ralph Lauren, Michael Kors, Banana Republic, Hugo Boss, INC, H&M, Hermes, J. Crew, Kenzo, Benetton. Represented by agencies VNY Model Management New York, Bananas Paris, FM Agency London, Milan d'management group. Finish school and became a doctor, or after modeling to become an actor. I wash my face, take a shower, relax and headed to my casting and agency. My fashion tip is to stay humble, motivated, confident in yourself. My friends would describe me as goofy, silly, funny, and definitely corny. I like to crack jokes, that's what I do. I just love to make people laugh. I think I would like to be that guy on the big screen that makes everybody crack up.